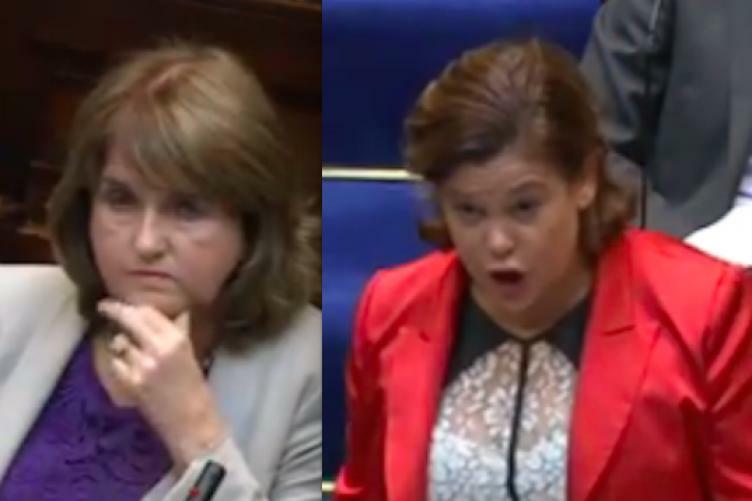 TÁnaiste joan burton has waded into the row over Mary Lou McDonald’s refusal to withdraw or apologise for naming former politicians in the Dáil chamber who were alleged to have evaded tax. Those named have denied the allegations and a committee has found that the Sinn Féin deputy leader abused her right to absolute privilege in the Dáil chamber by naming them. McDonald said yesterday she accepts “people’s right to their good name”, but won’t be apologising as she has done nothing wrong. She also claimed that some “political insiders” have been unfairly critical of her. Speaking to reporters at an event in Dublin today, Burton said that McDonald should “reflect on the hurt and the damage that she has done to particular individuals”. The Labour leader continued: ”This is part of stunt politics. The Constitution is slightly above stunt. “It’s a really critical freedom that we have in Ireland, to march into the Dáil, speak our minds, and name names as appropriate and no one wants to interfere in anyway in that fundamental democratic freedom. But it’s one thing to do that and it’s another thing to waltz into the Dáil, with a document in your hand, coming from a committee, that she’s a member of. She has plenty of opportunity there to do whatever she wants to do in that committee but at the same time to ensure that she doesn’t undermine it. In a further stinging attack on Sinn Féin, Burton laimed that if the party was in power tomorrow the “last thing they might want would be to have the kind of freedom that’s embedded in the Constitution about free speech”, citing its treatment of abuse victim Mairia Cahill. Amid reports that government chief whip Paul Kehoe will write to Ceann Comhairle Seán Barrett, recommending a motion of censure against McDonald, Burton would not be drawn on whether she would support such a motion. “I think we would have to hear the Ceann Comhairle’s view in relation to that,” she said. Elsewhere, the Fianna Fáil TD Timmy Dooley said his view was that there should be an automatic sanction for any member of the Dáil or Seanad found to be in breach of parliamentary privilege. “It should be a month’s forfeiture of their salary. It would be procedure put in place by way of standing orders,” he said.